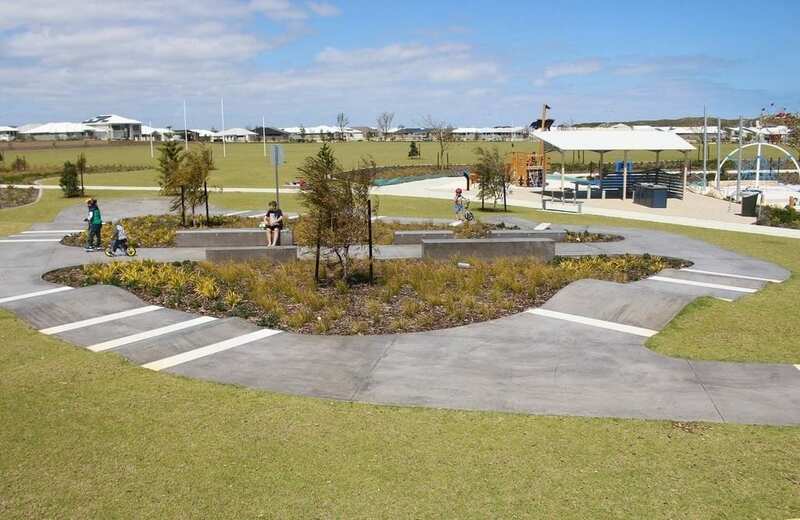 The Northern Suburbs have given us yet another fantastic park! 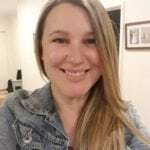 At the Amberton Estate in Eglington, you’ll find the new park Heath Park also known as the Amberton Scooter Park and Pirate Playground. The park is a fair distance from the road and car park, about 100 meters, which makes it ideal for younger children not playing close to traffic. The biggest attraction of this park HAS to be the scooter park. 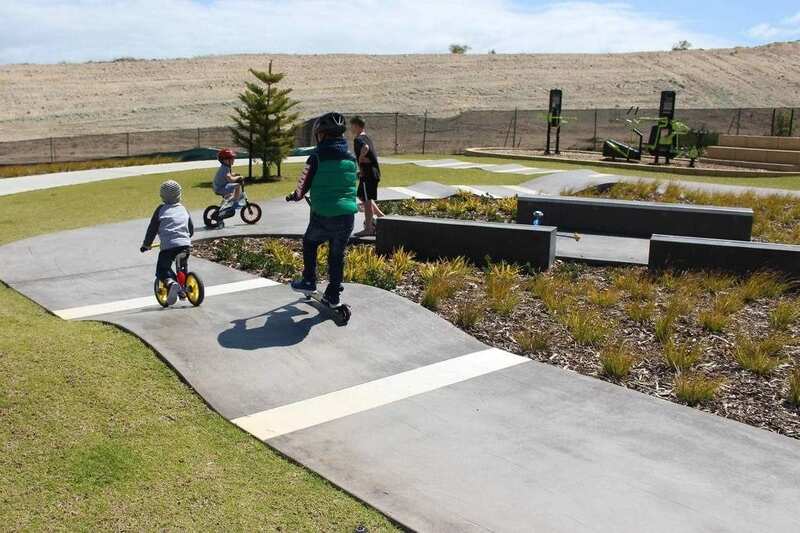 A dedicated scooter track is an excellent idea and is similar to a scaled down skate park – perfect for younger children. There are gentle curves and small humps that are easily navigated by a scooter. There were a few young children there on bikes too. 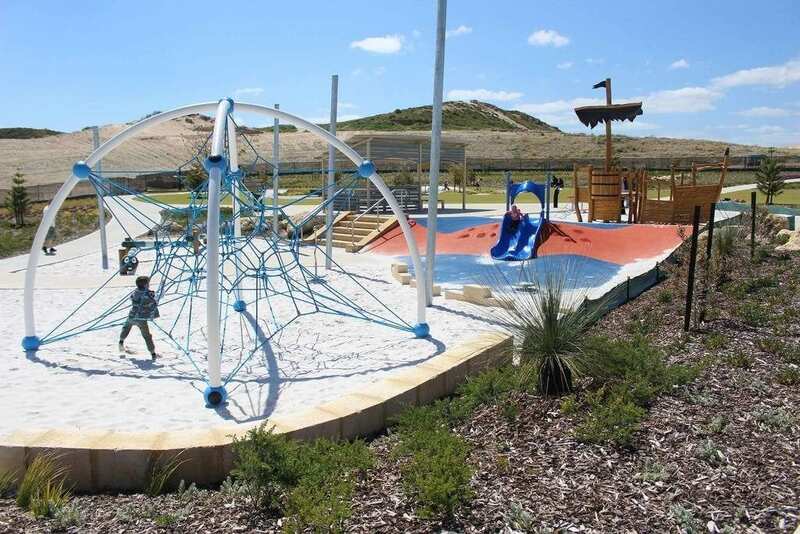 Heath Park is packed with climb-able, slide-able, explore-able equipment. 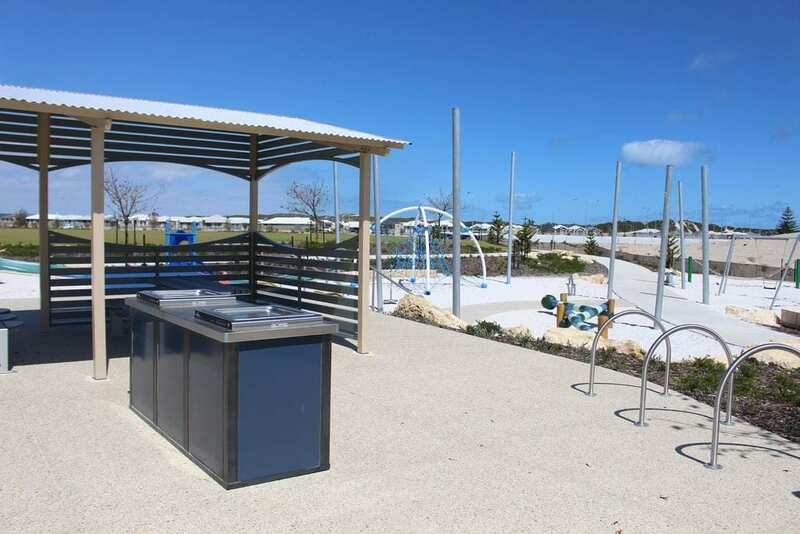 It has a mostly sandy surface – so bring along a bucket and spade too. 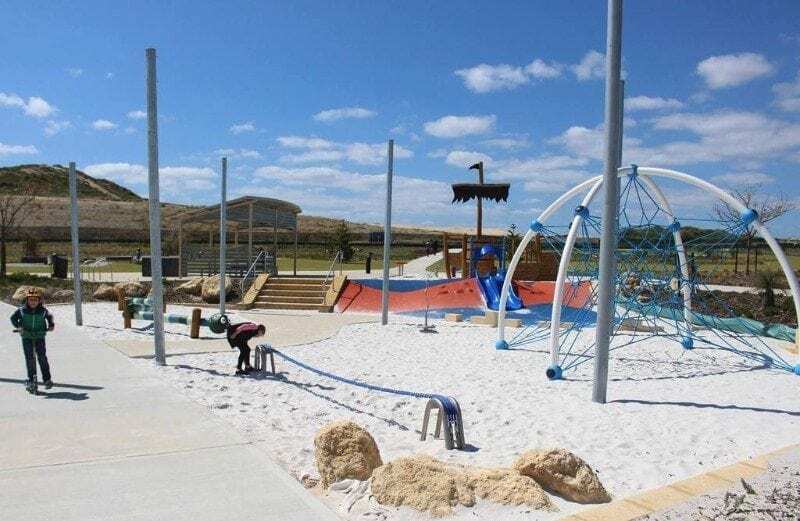 A lot of the sand fall play equipment is aimed at the toddler/kindy age group like a small side by side slide – which is perfect for little ones to race their mates! 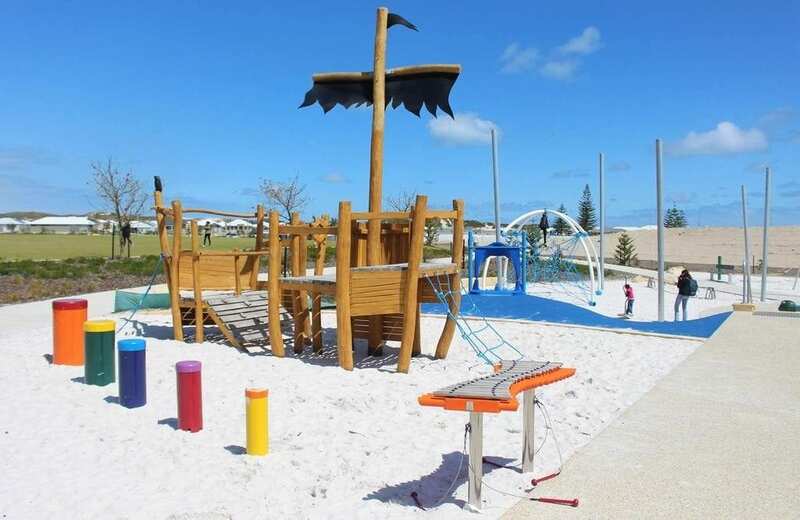 One of the playground’s most popular features is a wooden pirate ship. When we visited there was a lot of imaginative play and climbing happening aboard. It has different levels to climb onto, ropes and a small climbing wall. There’s also some brightly painted caterpillar balancing logs, spinning equipment, a long balancing rope (which I tried out too and failed miserably! ), traditional swings and a hammock swing which a few kids can sit on together. One of our favourite things about the playground was the xylophone. It’s a large wooden instrument, with a few hammers attached for belting out a tune. Unlike a lot of musical equipment at parks, this xylophone has a great sound and you can actually play a tune on it! The fantastic star shaped rope climbing frame is another fun feature. It’s quite large and your little monkeys will love climbing it to see how high they can reach. As well as all that, there is a huge AFL sized oval, complete with goalposts. Perfect for a game of footy or other ball game. For the adults, there’s an exercise circuit, with exercise stations dotted around the oval and also by the scooter park – so you can work out on the stepping equipment whilst watching the kids. The playground has no natural shade, though poles for shade sails are installed, ready for summer. There are no toilets around the park at present. The closest available loos are at the Amberton Sales Office. 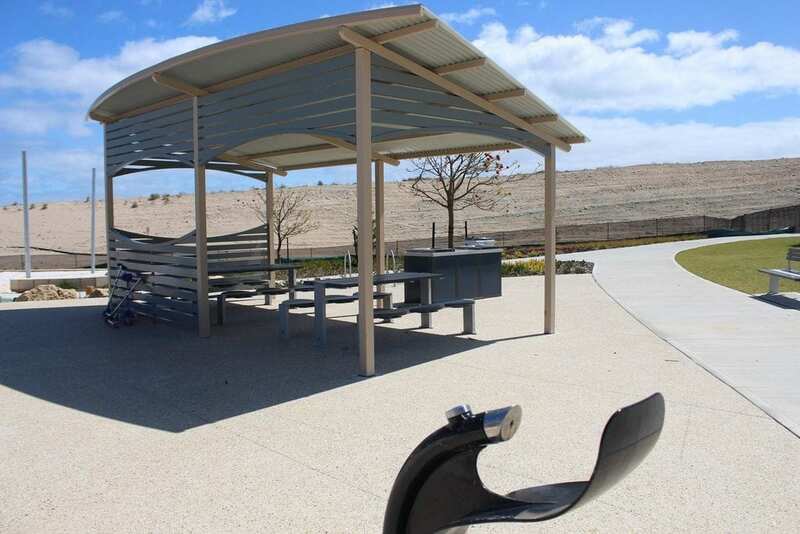 In between the playground and the scooter track are two sheltered picnic tables and benches, with BBQ facilities – great for a get-together. There’s also a drinking water fountain. How to get there… Enter the Amberton Estate in Eglington from Marmion Avenue. If you drive a little further along Cinnibar Drive (past Eglinton Park) you’ll come across Heath Park and its carpark. At the far end of the oval at Heath Park is the scooter park and pirate playground.